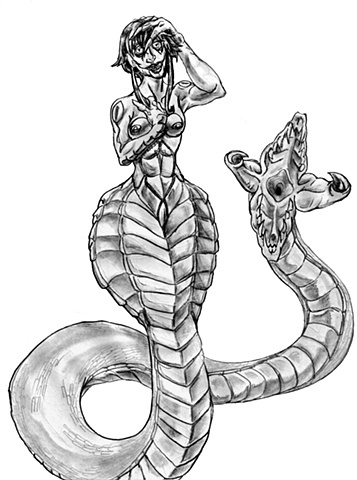 A monster mother, The Lamia. "Lamia was a beautiful queen of Libya who was cursed to become a child devouring demon. This came about when she had an affair with Zeus and begat his children. Hera, known to not take kindly to her husband's affairs, stole her children away, and in her grief, ripped out her eyes.Her rage turned her/ Hera cursed her/ or Hecate changed her into a monster that would steal other mother's children and devour them." "Lamia was the daughter of Poseidon and the mother of sea monsters,Skylla and Akheilos. And she was apparently a large, monstrous shark." Lamia was also given the gift of foresight, yet cursed with never closing her eyes, keeping her forever obsessed over her lost children. Zeus, in an act of mercy, granted her the ability to remove her eyes from their sockets so that she can catch a break. Lamia is also said to possess a vicious sexual appetite that is akin to their cannibalistic desire to eat children and were often associated with Lilim and succubi. The depiction of her with a serpent's tail is actually a construction of a poem by John Keats, whereas the myth says she merely has a horrific face. In Christian religious texts, she is akin to a succubus and used also as a symbol of hypocrisy. My version of the Lamia, uses the Keats poem description, while I studied anime's Yandere archetypes (a person who is sweet at first, but becomes mentally unstable and violent) for their crazed eyes and expressions. The hair was a last minute change, as is her hand holding it, as I originally had her hand just touching her chest, but when drawing the hair and seeing it line up to her hand, I kept it. The lower snake half is adapted from Rosario+Vampire's hooded hips, with me changing the end from a mind drainer into a more literal devouring maw. The patterning is stereotyping the cobra patterns along her body to unify it all together.